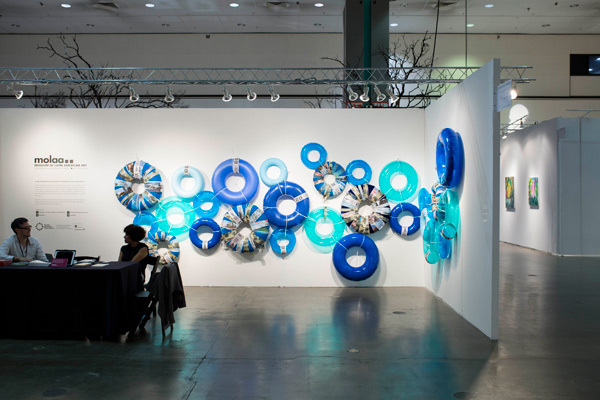 “In my Floating World, Landscape of Paradise”, a soft sculpture, Garcia collected inner tubes in different sizes and in a variety of shades of blue. She also bandaged the surface of some of the inner tubes with photographic images of the sea on which she has drawn a variety of symbols from her visual repertoire that refer to the memory of the sea. 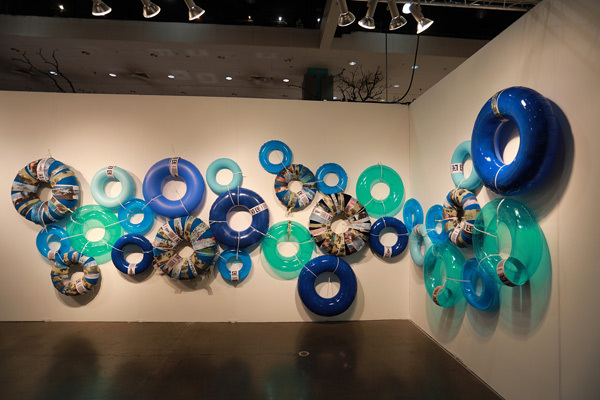 She composed a floating landscape with these inner tubes, creating a randomly organic form connected by electrical ties, sometimes tied very tightly, a suggestion of the struggles hidden within the deep blue beauty. 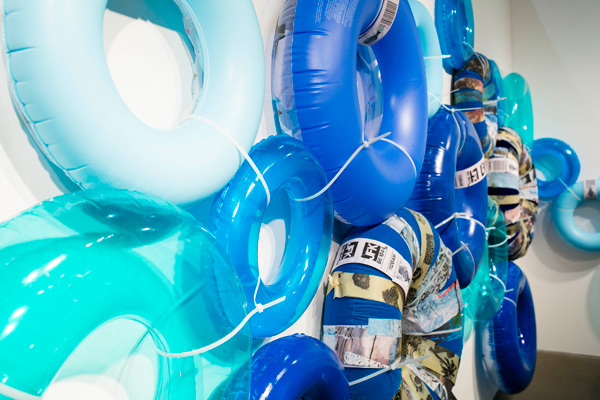 Also each of the inner tubes carries an airport baggage tag that identifies the intended destination of the waves, which is New York, alluding to the contemporary promised land of the free. Garcia’s work is multi-layered, vibrantly colorful, richly textured, and, as she stresses, always interdisciplinary, usually combining sculpture, painting or drawing, and written text. In it, she carefully joins everyday objects such as life jackets, inner tubes, suitcases, mattresses, tents, umbrellas, religious icons, and newspaper clippings together with her luminous paintings and drawings into a coherent whole. By turns lyrical, shocking, disarming, subtle, playful, confrontational and intellectual challenging, and often all of these things at once, the art is as versatile and multifaceted as the woman herself. Scherezade Garcia was born in Santo Domingo. As a child she became involved in the arts by participating in projects that involved mural painting with visual artists Elias Delgado and Nidia Serra. She studied at Altos de Chavon/The School of Design, an affiliate of Parsons School of Design.